PEARL HARBOR – A 2015 Coral Glades High School graduate and Fort Lauderdale, Florida, native is serving in the U.S. Navy as part of the world’s largest international maritime warfare exercise, Rim of the Pacific (RIMPAC). 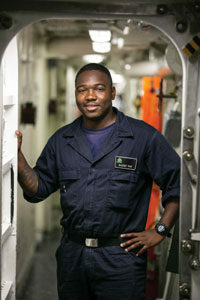 Seaman Maleque Shaw is a gunner’s mate aboard USS Preble, currently operating out of Pearl Harbor, Hawaii. A gunner’s mate is responsible for the maintenance of the weapons on the ship and qualifying personnel on how to properly handle weapons. Shaw applies the lessons he learned from Fort Lauderdale to his work in the Navy. “I’m most proud of my rate and all the history that comes with it,” said Shaw. As a member of the U.S. Navy, Shaw and other sailors know they are part of a legacy that will last beyond their lifetimes providing the Navy the nation needs. I’ve learned how to interact with people of different cultures and personalities since joining the Navy,” said Shaw.